Doug Beardsley has published seven books of poetry, and three books about hockey—Canada's national game. He is also known as an authority on the Holocaust. His new and selected poems, Wrestling with Angels, appeared from Montreal's Signal Editions in 1995. He is married to literary critic and poet, Rosemary Sullivan. Doug Beardsley taught at the University of Victoria from 1981 to 2006. 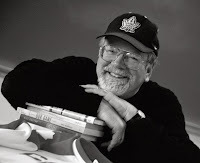 He collaborated with celebrated Canadian poet Al Purdy on two books. The Man Who Outlived Himself, about John Donne, and No One Else is Lawrence, honouring the poetry of D.H. Lawrence. The Canadian Encyclopedia also notes Beardsley is "a friend and longtime correspondent of Irving Layton," another of Canada's best known poets. The following poem is from Doug Beardsley's book Kissing the Body of My Lord: the Marie Poems (1982), which is a series of poems written from the point of view of Marie of the Incarnation—the leader of a group of nuns who came to New France (Quebec) to establish the Ursuline Order in 1639.
my feeble faith. Why You came to me I cannot know. how we pass through cannot be called sin. We live by what we love. the way the sisters draw water from our frozen well. life's encircled sorrow, this anguished end.